What do DAILY DEAD , HORROR FUEL, HORROR NATION , ADDICTED TO HORROR MOVIES, TOM HOLLAND’S TERROR TIME, DREAD CENTRAL, HORROR SOCIETY and HORROR SCREAMS VIDEO VAULT have in common with 8 Digital Cards from the film Night of Something Strange from Terror Films? Find all 8 cards and post them to our Facebook page or TAG us on your page and 25 lucky fans will win a free iTunes download of the film! 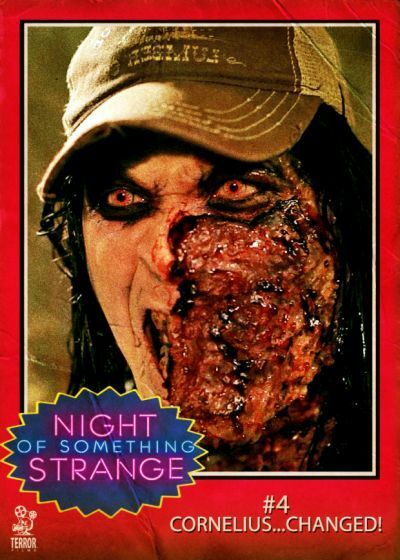 Here’s a head start and the card from Horror Nation (card for this is #3: TRANSFORMATION INTO THE MACABRE!-not Cornelius pic) You have the sites now track down the 7 remaining cards and claim your free iTunes download! This entry was posted in Uncategorized and tagged acting, Addicted to Horror Movies, comedy, Contest, Cornelius, Daily Dead, digital trading cards, Dread Central, evil dead, gore, horror, horror film, Horror Fuel, horror movie, Horror Nation, Horror Screams Video Vault, Horror Society, iTunes, night of something strange, STDs, Terror Films, Tom Holland's Terror Time, wayne w johnson, WWJ, zombies. Bookmark the permalink.